When I travel I always pack way more yarn that I could realistically use on my trip...just in case. I would not ever want to run out and stress over not having ANY projects! Last week, I visited my parents in Mandeville, Quebec for a couple of days and came packed to the gills. Actually brought enough yarn for 3 projects, and I managed to complete one. 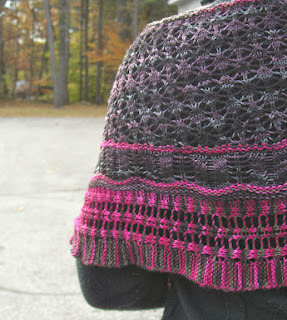 In honor of where I was, I named this shawl, what else, "Mandeville." It uses one hank each of 2 colors of Crock-O-Dye (65% superwash wool/20% nylon/15% silk). 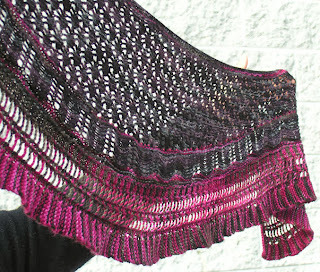 The lower edging is worked first side-to-side in color 224 Neon Nights (check out how the colors striped naturally!). Most of the upper section is worked using color 734 Plum Black filling in using short rows. We are inviting a limited number of knitters to "test knit" this project before I launch the pattern. A test knitter is a knitter who will knit their own sample, using their own yarn, and let us know of any pattern issues so we can correct before officially offering the pattern for sale. They get a free copy of the pattern (the original, and any final corrected version), and get to be the first select ones to work on it before anyone else. I will also offer a free copy of any of my patterns (your choice) once your test knit is complete, as long as you have met all the requirements. You can read about it here (note that this is a time sensitive project, so depending on when you are reading this blog post, the open participation may be closed). Knitwear designer for more than 30 years, owner of Knit One, Crochet Too, the yarn company, since 2003.